Different species of microorganisms including yeasts, filamentous fungi and bacteria have been used in the past 25 years for the controlled production of foreign proteins of scientific, pharmacological or industrial interest. A major obstacle for protein production processes and a limit to overall success has been the abundance of misfolded polypeptides, which fail to reach their native conformation. The presence of misfolded or folding-reluctant protein species causes considerable stress in host cells. The characterization of such adverse conditions and the elicited cell responses have permitted to better understand the physiology and molecular biology of conformational stress. Therefore, microbial cell factories for recombinant protein production are depicted here as a source of knowledge that has considerably helped to picture the extremely rich landscape of in vivo protein folding, and the main cellular players of this complex process are described for the most important cell factories used for biotechnological purposes. One of the main bottlenecks in recombinant protein production is the inability of the foreign polypeptides to reach their native conformation in heterologous host cells, which usually results into their prevalence in the insoluble cell fraction. The unusually high and non-physiological rates of recombinant protein production and the occurrence of significant amounts of misfolded protein species drive the cells to a global conformational stress condition. This situation is characterized by a series of individual physiological responses provoked in order to minimize any toxicity of misfolded protein species and to restore cellular folding homeostasis. The generalized use of microbial cell factories for biological synthesis of proteins and the growing interest in the physiological aspects of conformational stress have converted recombinant cells into schools of protein folding, from which scientists are learning about the cell-protein relationships during the complex process of in vivo protein folding. The purpose of this review is to summarize the major concepts of the cell biology of protein folding. For that, eukaryotic cells, illustrated by yeasts and filamentous fungi are dissected regarding the mechanics and composition of their folding machinery, misfolding stress responses and strategies to cope with conformational stress. The complexity of the folding, trafficking and secretion machineries of these cell factories is presented versus the relatively simple folding scheme in bacterial cells such as Escherichia coli that are also common hosts for recombinant protein production. Despite the existing obvious differences, evolutionary conserved physiological traits regarding folding stress can be identified when comparing eukaryotic and prokaryotic hosts. Furthermore, practical implications of all these findings to improve protein production processes are discussed in their biotechnological context. Yeasts and filamentous fungi are among the most frequently used eukaryotic cell systems for recombinant protein production, in part due to the performance of post-translational modifications that bacteria cannot perform, that are, in most cases, required for proper protein activity. In eukaryotic cells, endoplasmatic reticulum (ER) resident proteins are responsible for correct protein folding. The list of such folding-assistant proteins includes calnexin, chaperones of the hsp70 and hsp90 families (e.g. BiP/Grp78, Grp94), the protein disulfide isomerases (Pdi) which catalyze the formation of disulfide bonds and the peptidyl-prolyl-isomerases. Some of the post-translational modifications such as N-glycosylation are initiated in the ER lumen. Both natural and recombinant proteins are only exported to the Golgi by vesicular transport when their correct conformation has been assured by a glucose-dependent surveillance mechanism of the ER. Unless there is a differing signal, proteins intended for secretion are directed from the Golgi to the outside of the plasma membrane by specific transport vesicles [1, 2]. A schematic overview of the protein folding processes is presented in Figure 1, while the responses to secretion stress are summarized in Figure 2. Schematic representation of protein folding, quality control, degradation and secretion in yeast (as an example for lower eukaryotic cells). Secretory proteins are transported into the ER through the Sec61 translocon complex of the ER membrane either co-translationally or post-translationally. In the latter case, cytosolic chaperones (Ssa1-4, Ssb, Sse1/2) support solubility and prevent aggregation of the polypeptide chains. After translocation to the ER, nascent polypeptides are bound by BiP and mediated to mature folding in an ATP-dependent cyclic process of release of and binding to BiP. The formation of correct disulfide bonds is mediated in a cycle of Pdi and Ero activity, which may lead to the formation of reactive oxygen species (ROS). Correctly folded protein is released to transport vesicles, while prolonged BiP binding, indicating misfolding, leads to retrograde translocation to the cytosol and proteasomal degradation (ERAD). Nascent glycoproteins are bound by calnexin and mediated to correct folding and processing of the N-glycans. 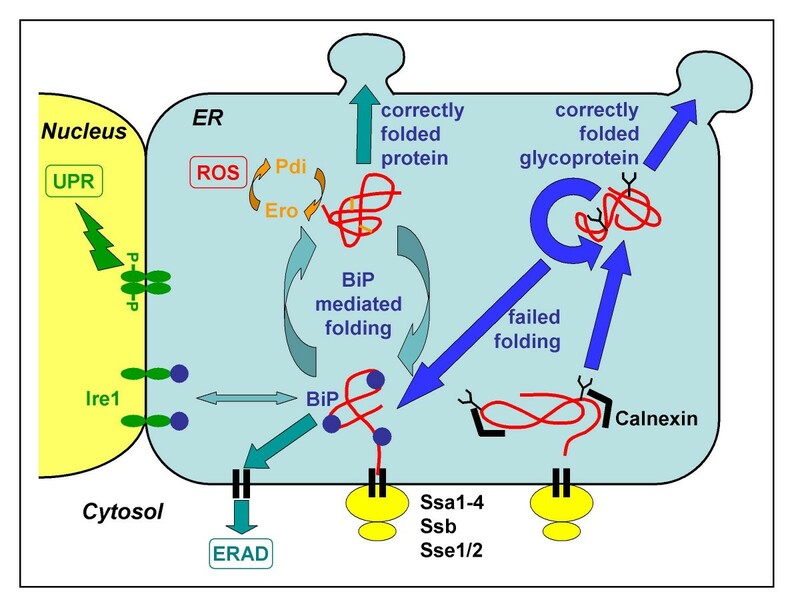 Failed folding leads to binding by the BiP complex and targeting to ERAD, while correctly folded and processed glycoproteins are released to transport vesicles. Prolonged binding of BiP to partially misfolded proteins leads to the induction of the unfolded protein response (UPR), mediated by Ire1 (see also figure 2). Schematic representation of secretion stress responses in eukaryotes Secretory proteins are translocated to the ER either during their translation or post-translationally. Folding of these proteins in the ER can be disturbed by environmental factors or it can be inhibited experimentally by agents inhibiting protein folding like dithiothreitol (DTT) and Ca-ionophores or agents inhibiting glycosylation like tunicamycin. It has been observed that foreign proteins often do not fold well and cause conformational stress. Several responses of the cell to impaired protein folding in the ER have been discovered: 1.) Unfolded protein response (UPR). Genes encoding folding helpers like the chaperone Bip and the foldase protein disulfide isomerase Pdi, and a large number of other genes involved in other functions of the secretory pathway are induced. The proteins Ire1 and Hac1 involved in this signal transduction pathway are shown in the figure. 2.) Translation attenuation. The translation initiation factor eIF2 alpha is phosphorylated, and subsequently translation initiation is inhibited. This reduces the influx of proteins into the ER. This response is only known from mammalian cells. 3.) Repression under secretion stress (RESS). The mRNA levels of genes encoding secreted proteins are down-regulated during ER stress. This response has been discovered in filamentous fungi, but there is evidence for its occurrence in plants. The protein folding process and subsequent secretion is a rather complex process involving many interacting participants. Due to this interdependence, genetically increasing the rate of one step can lead to rate-limitation of another one, which can then become the bottleneck of the expression system. Moreover, in most cases the rate limiting step in the eukaryotic secretion pathway has been identified to be the exit of proteins from the ER . Linked to this control point is a mechanism called ER-associated protein degradation (ERAD), which is responsible for the retention of misfolded or unmodified non-functional proteins in the ER and their subsequent removal. Protein degradation is executed by linking the misfolded protein to ubiquitin after it has been re-translocated into the cytosol through the same ER translocon pore where it had been imported. The ubiquitin-marked protein is then recognized and degraded by the 26S proteasome in the cytosol (recently reviewed by [4, 5]. Two quality control systems in the ER ensure that only correctly folded, modified and assembled proteins travel further along the secretory pathway. The UDP-glucose:glycoprotein glucosyltransferase (UGT) is a central player of glycoprotein quality control in the ER (reviewed among others by ). After addition of the core glycan (GlcNac2-Man9-Glc3) to specific asparagine residues of the nascent polypeptide, the three terminal glucose residues have to be clipped off before the protein can exit the ER. Non-native polypeptides are tagged for reassociation with the ER-lectin calnexin by readdition of the terminal glucose onto the N-glycan mediated by UGT. This enzyme specifically recognizes and binds to molten globule-like folding intermediates, thereby acting as sensor of the protein folding status. Re-glucosylation of erroneous glycoproteins prevents their release from the calnexin cycle and subsequent secretion. Upon persistent misfolding, N-glycosylated polypeptides are slowly released from calnexin and enter a second level of retention-based ER quality control by aggregating with the BiP chaperone complex . This correlates with the loss in the ability to emend misfolding. The BiP complex is involved in co-translational translocation of the nascent polypeptide into the ER lumen and preferentially binds to hydrophobic patches. Prolonged binding to either calnexin or the BiP complex targets the polypeptides to the ERAD, however, the exact mechanisms remain elusive (reviewed by ). The fact that accumulation of proteins in the ER is able to influence the synthesis of foldases and chaperones such as BiP and Pdi by transcriptional activation in the nucleus lead to the conclusion early on that there must be an intracellular signalling pathway from the ER to the nucleus, called the unfolded protein response (UPR) (for reviews see [8, 9]). After having passed ER quality control successfully, proteins intended for secretion have to be transported to the Golgi network. Specialized cargo vesicles that selectively incorporate these proteins bud from the ER and are targeted to the Golgi membrane by the activity of the coat protein complex II (COPII). In the Golgi network proteins undergo additional post-translational modifications and are subjected to sorting mechanisms that finally target them to their final destination. Possible trafficking routes include direction to the plasma membrane, to the endosomal compartments, to the vacuole, as well as retrograde transport to the ER (review by ). Secretory proteins are then delivered to the cell surface by specialized post-Golgi secretory vesicles that dock to and fuse with the plasma membrane. The process called exocytosis includes targeting of the secretory vesicles to the appropriate membrane mediated by the Exocyst, a multiprotein complex, and by interaction of the v-SNAREs (vesicle, in yeast: Snc1/2 proteins) and t-SNAREs (target membrane; Sso1/2p and Sec9p) and release of the cargo proteins outside the cell after fusion of the secretory vesicle with the plasma membrane. During the recent years, it has become evident that a variety of metabolic and environmental stresses may have a strong impact on recombinant protein production. Both types of stress factors occurring during industrial production processes in yeasts, along with potential metabolic and cell engineering approaches to overcome production constraints, were reviewed in Mattanovich et al. . Among environmental factors that affect protein folding and secretion, especially temperature, low pH, high osmolarity and oxidative stress may play an important role. While many studies have been performed on optimizing fermentation conditions for maximum specific productivity in yeasts, data correlating increased product yields to improved protein folding and secretion mechanisms are still missing. Similar reports regarding the impact of cultivation conditions on protein production in filamentous fungi remain scarce and usually limited to case studies [12–14]. Wang et al. reviewed the impacts of bioprocess strategies on recombinant protein production in filamentous fungi, and concluded that the major effect of the environmental changes correlates to varying morphological forms, which exhibit different secretory capacities. Temperature has a profound impact on cell metabolism and abundance/regulation of folding-related genes/proteins (hsp70 family, ER-membrane proteins, etc.). Lowering the cultivation temperature from 30 to 20–25°C has been reported to increase product titers in yeasts in several cases [16–19]. While it may be speculated that a lower growth temperature is leading to lower specific growth rates, thus enabling folding of the recombinant proteins at a lower rate, it was shown recently in chemostat cultures that actually gene regulatory events take place. In continuous cultures of Pichia pastoris expressing a human antibody Fab fragment specific productivity of the heterologous protein was significantly increased during the chemostat process at lower temperature (1.4-fold on average). Several genes related to protein targeting to the ER and folding (SSA4, SEC53, KAR2, ERO1) and core metabolism genes were found among the genes down-regulated at 20°C, as were the product genes . Transcription of genes involved in the regulation of vesicular transport, exocytosis, ER-associated protein degradation as well as markers for response to oxidative and hyperosmotic stress was enhanced in comparison to 25°C steady state. The reduction in transcriptional activity of the core metabolism is a likely explanation for the reduced mRNA levels of the product genes (LC and HC), which were under control of the glycolytic GAP (glyceraldehyde 3-phosphate dehydrogenase) promoter. The authors hypothesized that at lower temperature a reduced amount of folding stress is imposed on the cells, consequently leading to a higher rate of correctly folded product. Although lower temperature has been shown to improve protein secretion rates, this still depends on the nature of the heterologous protein. Production of a hyperthermophilic enzyme was improved by cultivation at higher temperature (40°C) in Saccharomyces cerevisiae, thereby reducing ER folding stress . Additionally to regulatory events, many positive effects of temperature shifts on protein production might be linked to cell wall composition (porosity) and cell cycle. Indeed, increased levels of chitin and cell wall linking beta-glucans have been determined in yeast cells grown at 37°C compared to 22°C in batch cultures . Generally, it turns out that cultivation at an optimized temperature is one of the crucial parameters for improved specific productivity, as it is likely to direct carbon fluxes towards heterologous protein production, and maintains the cells in the more secretion competent phases of the cell cycle. Redox processes play a major role in heterologous protein production, both related to the oxidation of the product to form disulfide bonds, and to oxidative stress of the host cell during cultivation. Cultivation of methylotrophic yeasts like P. pastoris on methanol leads to significant oxidative stress, which may be relieved by the addition of antioxidants like ascorbic acid . Similarly, the expression of antioxidant enzymes like superoxide dismutase was reported to relieve oxidative stress . Apart from environmental stressors, oxidative stress can be imposed on the host cells by intrinsic factors such as leakage in the respiratory pathway, beta-oxidation of lipids, or accumulation of misfolded protein in the ER. There is strong evidence that oxidative stress is connected to growth temperature. While in most cases lower growth temperature results in lower oxidative stress, Gasser et al. showed that the genes coding for the key regulatory enzymes of both the cell redox homeostasis (thioredoxin reductase TRR1, thioredoxin peroxidase TSA1, glutathione oxidoreductase GLR1) and osmoregulation (mitogen-activated protein (MAP) kinase HOG1) were induced at the lower temperature where higher secretion rates occur. Generally, the secretory pathway compartments maintain a higher oxidized status compared to the cytosol in order to enable disulfide-bond formation. Finally the electrons generated during the oxidative folding cycles are transferred to molecular oxygen and may lead to the formation of reactive oxygen species . Interestingly, it was shown recently that very low oxygen supply enhances the secretion rate of heterologous proteins in P. pastoris significantly, which led to the development of a hypoxic fed batch strategy with over 2-fold increased productivity . So far no clear connection between medium osmolarity and protein folding has been established. Previous data indicate that the response is extremely transient ; and even less is known of the effect of osmolarity on heterologous protein production. Mager and Siderius  describe temporary cell growth arrest (either at G1 or G2/M) upon hyperosmotic stress conditions accompanied by the induction of the high osmolarity glycerol (HOG) kinase pathway in S. cerevisiae. Intracellular glycerol levels are increased in order to adjust osmo-balance through the modification of cell wall integrity. Unlike in animal cells where an osmotic shock leads to increased exocytosis , and hyperosmotic GS-NS0 mammalian cells that exhibit an increased specific production rate (albeit decreased growth rate) as compared with iso-osmotic cultures , osmo-regulated secretion behaviour in fungi remains unproven. In methanol grown P. pastoris cells, salt stress prior to induction was shown to have a positive effect on single chain antibody scFv titers , while Lin et al. reported a negative effect of salt supplementation on the secretion of an Fc fusion protein. Osmolarity and pH seem to trigger highly interrelated responses. From an industrial point of view the main desired effect of low pH is to reduce the activity of host proteases which can lead to severe protein degradation (reviewed among others by ), but no uniform picture has been assigned to the correlation of pH and protease activity in the culture broth. Both in yeasts and filamentous fungi changing the pH of the culture medium can significantly improve protein yields, however, this effect is most probably not directly associated with improved protein folding mechanisms. On the other hand, lower extracellular pH requires higher energy to maintain intracellular pH values constant/physiological, thereby delaying cell growth and enforcing the cell wall barrier [22, 32, 33]. Subsequently this more rigid cell wall may diminish secretion efficiency of the pH stressed cells. Lin at al. tested different pH values (ranging from 3.0 to 7.2) during fed batch production of a Fc fusion protein in P. pastoris and reported detection of the heterologous protein only at the highest pH of 7.2, however, the authors conclude that the pH optimum is strongly protein and strain dependent. The ER-resident chaperone BiP (binding protein, in yeast encoded by KAR2) belongs to Hsp70 family of heat shock proteins and it is present in the lumen of the endoplasmatic reticulum of all eukaryotes. The yeast homologue is sometimes referred to as Grp78. Binding to BiP prevents the nascent part of secretory or transmembrane proteins from misfolding, until synthesis of the protein is finished. It has been suggested that BiP is not only involved in the translocation of the nascent polypeptides across the ER membrane into the ER lumen, but that it is a key element of an ER-resident quality control mechanism that prevents unfolded proteins from leaving the ER . Other functions associated to BiP are the solubilisation of folding precursors, stabilization of unassembled protein subunits and redirecting misfolded polypeptide chains to the cytosol for ubiquitin-labeling and subsequent degradation by the proteasome (ERAD, ER-associated protein degradation, ). Besides a basal constitutive expression level, BiP transcription is induced by the presence of mutant and misfolded proteins in the ER lumen and by stress effects that result in the accumulation of unfolded proteins , presumably including the high level expression of heterologous proteins. A saturation of the secretory pathway seems possible, as extractable levels of free folding assistants BiP and Pdi1 decrease when heterologous proteins are overexpressed in S. cerevisiae . Kauffman et al. observed an induction of BiP during the expression of a scFv fragment in this yeast species, and Hohenblum et al. have reported increased levels of BiP upon expression of recombinant human trypsinogen in P. pastoris. Likewise, biPA and pdiA transcript levels were increased due to heterologous protein overexpression, as well as upon high level secretion of homologous enzymes in filamentous fungi [40–42]. ER-associated protein degradation is a complex process in which misfolded proteins in the ER are redirected to the translocon for retranslocation to the cytosol, where they are subjected to proteasomal degradation. Additionally, excess subunits of multimeric proteins that are unable to assemble are degraded through the ERAD mechanism. According to Plemper et al. , the malfolded proteins are retro-translocated through the Sec61-complex translocon pore, through which they had entered the lumen of the ER before, accompanied by ubiquitination at the cytosolic side of the ER membrane. The labeling of substrates destined for degradation by the cytosolic 26S proteasome requires an Ub (ubiquitin) activating enzyme, an Ub conjugating enzyme and an Ub ligase besides ubiquitin itself. In P. pastoris three essential components of the ERAD pathway have been shown to be up-regulated upon production of an antibody Fab fragment in correlation to higher protein secretion rates: HRD1, coding for an Ub protein ligase, that is able to recruit Ub conjugating enzymes (such as the gene product of UBC1) next to the Sec61 translocon pore complex . Prolonged ER retention of misfolded proteins entails repetitive rounds of oxidative protein folding attempts by foldases such as Pdi and consequently results in the generation of reactive oxygen species (ROS). Alleviation of the ER stress is accomplished by the upregulation of the UPR and subsequent induction of the ERAD, however, prolonged UPR induction can also contribute to the stress situation by the accumulation of ROS. In this context, both oxidative stress and ERAD occur in addition to UPR induction when hydrophobic cutinase accumulates in the ER of S. cerevisiae , while hirudin production in P. pastoris lead to increased levels of ROS . Recently it has been shown that overstraining or failure of the ERAD components leads to persistent ER stress conditions and subsequent cell death in both yeasts and higher eukaryotic cells [45, 46]. The unfolded protein response pathway is activated by a unique mechanism not known in any other signal transduction pathway (for a recent review see ). The sensor protein Ire1p  resides in the ER membrane and possesses both kinase and endonuclease activities. When unfolded proteins accumulate in the ER, Ire1p undergoes autophosphorylation and oligomerisation, and catalyses the cleavage of the mRNA encoding the UPR transcription factor, called Hac1/hacA in yeasts and filamentous fungi [49, 50] or Xbp1 in mammalian cells . In this way Ire1p initiates an unconventional intron splicing event that has been shown in S. cerevisiae to be completed by tRNA ligase . Splicing of yeast HAC1 mRNA removes a translation block mediated by the intron  and enables formation of the activator protein. For mammalian Xbp1 it has been shown that the unspliced mRNA produces an unstable protein that represses the UPR target genes, whereas the spliced mRNA is translated to a potent, stable activator protein . In the filamentous fungi Trichoderma reesei, Aspergillus nidulans  and Aspergillus niger , the hac1/hacA mRNA is truncated at the 5' flanking region during UPR induction, in addition to the unconventional intron splicing. This truncation removes upstream open reading frames from the mRNAs, most probably increasing translation initiation at the start codon of the HAC1/HACA open reading frame. Kincaid and Cooper  identified a novel function of Ire1p in the degradation of mRNAs encoding selected secretory proteins thus avoiding potential overload of the ER and the translocon complex a priori. ER-associated stress responses such as UPR and ERAD were reported to be induced upon overexpression of several heterologous proteins, e.g., human tissue plasminogen activator (t-PA) in T. reesei  and A. niger , and bovine chymosin in A. nidulans . Similarily, overexpression of Fab fragments  and Rhizopus oryzae lipase  revealed UPR induction in P. pastoris. In another layer of ER stress regulation, mammalian cells can attenuate translation initiation during unfolded protein accumulation into the ER, in order to reduce the influx of proteins to the ER. This regulation pathway is initiated by the ER membrane kinase PERK that has some similarity with Ire1 . PERK phosphorylates the translation initiation factor eIF2alpha, resulting in drastic reduction in translation. This mechanism is not known in yeasts or filamentous fungi, and PERK orthologues can not be found in the genomes of the lower eukaryotes. Interestingly, the filamentous fungi T. reesei  and A. niger  have an alternative mechanism for controlling the protein influx to the ER. In conditions of ER stress the mRNAs encoding secreted proteins are rapidly down-regulated. This mechanism called RESS (re pression under s ecretion s tress) was shown to be dependent on the promoters of the genes encoding secreted proteins, and thus it probably functions at the level of transcription . It has been observed that in Arabidopsis thaliana a large number of genes encoding secreted proteins are down-regulated when cells are exposed to ER stress , implying the possibility that RESS might also exist in plants. Although promising expectations emerged that increased BiP levels would result in increased folding capacity in the ER, and thus improved secretion rates, the findings were rather inconsistent and unpredictable. Some studies emphasize that overproduction of BiP stimulates protein secretion in S. cerevisiae (5-fold increase in secretion of human erythropoietin , 26-fold increase in bovine prochymosin , 2.5-fold increase in the titer of antithrombotic hirudin due to 2.5 times higher biomass yields ). While the secretion level of plant thaumatin in Aspergillus awamori was increased up to 2.5-fold compared to a wild type strain due to bipA overexpression , the secretory behaviour of the same protein was not affected by overexpression of KAR2 in S. cerevisiae . According to Wittrup and coworkers, a reduction of BiP levels leads to decreased secretion of foreign proteins, however, no effect was observed upon a 5-fold overexpression of BiP on secretion levels of three different recombinant proteins in S. cerevisiae , and neither for cutinase in A. awamori . Other reports even suggest a negative impact of BiP overexpression, as extracellular levels of A. niger glucose oxidase (GOX) decreased 10-fold upon BiP overexpression in Hansenula polymorpha . As prolonged binding to BiP seems to direct proteins rather to degradation than to the secretory pathway, it becomes more obvious why the overexpression of this chaperone alone does not result in higher levels of secreted foreign proteins, but can negatively influence expression levels, as reported by Kauffman et al. and van der Heide et al. . Interestingly, Pyrococcus furiosus beta-glucosidase secretion in S. cerevisiae is diminished with increased BiP levels, but benefited from higher protein disulfide isomerase (Pdi) levels, although the protein did not contain any disulfide bonds , pointing at the chaperone activity of Pdi, as discussed below. Conesa et al. examined the impact of overexpression of two ER quality control factors, BiP and calnexin, on the secretion of glycosylated Phanerochaete chrysosporium manganese peroxidase (MnP) in A. niger, as the expression levels of these genes were induced upon recombinant protein production. While BiP overproduction diminished manganese peroxidase secretion levels severely, overexpression of calnexin resulted in a four- to fivefold increase in the extracellular MnP levels. Higher levels of calnexin also showed beneficial effects in mammalian and baculo virus expression systems [72, 73]. Recently, the co-overexpression of calnexin was shown to stimulate the secretion of three glycoproteins and one unglycosylated product (HSA) in H. polymorpha (2–3 fold on average; ). On the other hand, secretion of human serum albumin (HSA) remained unaffected by raising calnexin levels in Schizosaccharomyces pombe , while in S. cerevisiae deletion of the calnexin gene CNE1 was reported to enhance secretion of both antitrypsin  and unstable lysozymes [77, 78]. Protein disulfide isomerase (Pdi) is a multifunctional protein resident in the ER lumen that is responsible for the correct formation of disulfide bonds during oxidative folding and the isomerisation of uncorrectly folded disulfides. Apart from this foldase activity, Pdi also acts as a chaperone. An additional PDI gene copy in S. cerevisiae successfully improved secretion of human growth factor by 10-fold, of S. pombe acid phosphatase by 4-fold  and of human lysozyme by around 30–60% . Human lysozyme as well as HSA production could also be enhanced by the same strategy in Kluyveromyces lactis (1.8 fold and 15 fold, respectively; [80, 81]). 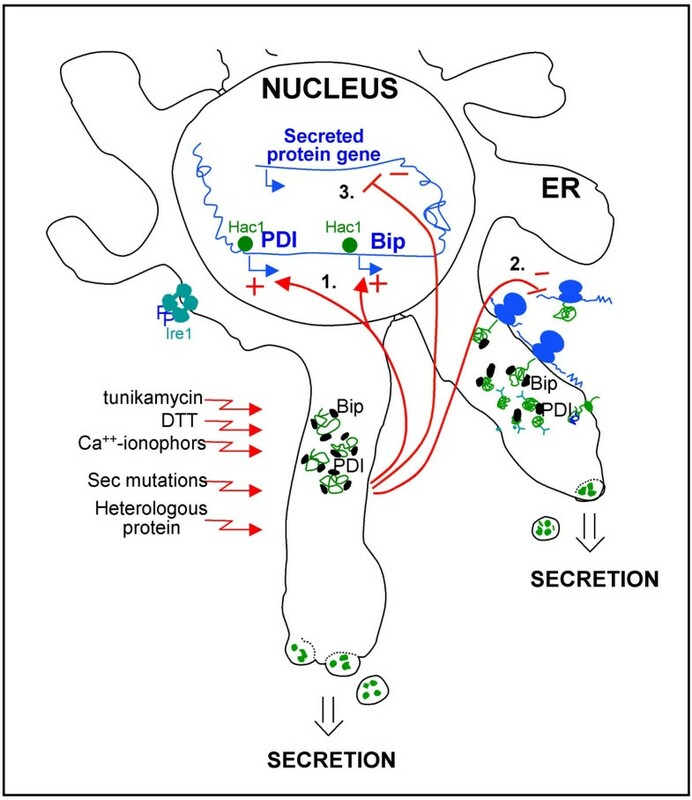 Both S. cerevisiae PDI1 and the P. pastoris own homolog were proven to be functional in P. pastoris by facilitating secretion of the human parathyroid hormone (hPTH, ), human anti HIV1 2F5 Fab , and Necator americanus secretory protein Na-ASP1 , the latter reporting a correlation between the secretory enhancement and the PDI copy number. Generally, no clear picture emerged from the co-overexpression of the two folding helpers, BiP and Pdi. Whereas synergistic action of BiP and Pdi was suggested regarding the improvement of the secretion of various single chain fragments (scFv) in S. cerevisiae , a 2-fold increase in secretion of the A33scFv in P. pastoris was only achieved by additional copies of KAR2, but not PDI, and not by the combination of both , in analogy to the antagonistic effect observed in CHO cells . Coexpression of KAR2, PDI1 or SSO2 exhibited no effect on secretion of gamma-Interferon (IFNgamma) in H. polymorpha . Moreover, coexpression of cypB, which encodes a foldase of the ER secretory pathway , did no increase production of tissue plasminogen activator (t-PA) in A. niger, although t-PA production elicited an UPR response detectable through elevated transcript levels of bip, pdi and cypB . Thus, it seems that the effect of coexpression of chaperone and foldase genes strongly depends on the properties of the target protein and, moreover, it seems that fine-tuned overexpression of these genes are required to generate a functional secretory network to improve foreign protein overproduction. For example, in A. niger, overexpression of bip to a certain threshold was beneficial for plant sweet protein thaumatin production, but above this threshold level thaumatin production decreased . Similarly, defined levels of Pdi were required for optimum thaumatin secretion in A. niger . The flavoenzyme Ero1 is required for oxidation of protein dithiols in the ER. It is oxidized by molecular oxygen and acts as a specific oxidant of protein disulfide isomerase (Pdi). Disulfides generated de novo within Ero1 are transferred to Pdi and then to substrate proteins by dithiol-disulfide exchange reactions . Duplication of either KlPDI1 or KlERO1 genes led to a similar increase in HSA yield in K. lactis, while duplication of both genes accelerated the secretion of HSA and improved cell growth rate and yield. Increasing the dosage of KlERO1 did not affect the production of human interleukin 1beta, a protein that has no disulfide bridges . Finally, another approach to stimulate the secretory pathway concertedly is to overexpress the unfolded protein response (UPR) activating transcription factor Hac1. Transcriptional analyses in S. cerevisiae revealed that up to 330 genes are regulated by Hac1, most of them belonging to the functional groups of secretion or the biogenesis of secretory organelles (e.g. ER-resident chaperones, foldases, components of the translocon). Interestingly, genes encoding proteins involved in protein degradation, vesicular trafficking, lipid biogenesis and vacuolar sorting are also induced by Hac1 . In this context, Higashio and Kohno  describe the stimulation of ER-to-Golgi transport through the UPR by inducing COPII vesicle formation. The homologs of S. cerevisiae HAC1 in T. reesei (hac1) and A. nidulans (hacA) have been identified  and the effects of UPR induction by constitutive overexpression of these genes have been evaluated. The heterologous overexpression of T. reesei hac1 in S. cerevisiae yielded a 2.4-fold improvement in Bacillus α-amylase secretion, and a slight increase in the yeast endogenous invertase as well as in total protein secretion. S. cerevisiae HAC1 overexpression was shown to enhance secretion of the endogenous invertase (2-fold), and recombinant α-amylase (70% increase), but did not effect secretion of T. reesei EGI, a protein supposed to accumulate in the ER. Disruption of HAC1 in S. cerevisiae led to a reduced secretion of the two recombinant proteins (α-amylase -75%, EGI -50%), but not of the endogenous invertase . Similar results could also be seen in A. awamori, where overproduction of A. awamori hacA ameliorated secretion of Trametes versicolor laccase and bovine preprochymosin 7-fold and 2.8 fold, respectively , and in P. pastoris, where heterologous expression of S. cerevisiae HAC1 increased the secretion rate of a Fab antibody fragment . All these approaches are limited to the existing knowledge base. Novel processes might be identified and targeted to improve secretion (including non-UPR regulated genes) through different approaches. In this regard, high throughput flow cytometry and cell sorting are valuable tools to isolate overproducing clones . One approach is to screen overexpression libraries for improved secretion of heterologous protein, which is anchored to the cell surface via agglutinin (Aga2p) and detected by immunofluorescent staining. Shusta et al. showed that the levels of surface-displayed single chain T-cell receptors correlated strongly with the soluble expression of the respective proteins. A 3-fold higher secreting clone could be isolated out of a library potentially as large as 108 in a couple of weeks . Screening of a yeast cDNA library in S. cerevisiae surface display strains identified cell wall proteins, translational components and the folding assistant Ero1 as beneficial for the secretion of various antibody fragments . However, one potential drawback of this high throughput method is that the display efficiency of the protein of interest can be dominated by its fusion partner Aga2p, as BiP and PDI overexpression had no effect on surface display levels of the scFvs although they increased soluble expression levels . Furthermore, genome-wide analytical tools like DNA microarrays are regarded as data mining source for physiological effects, stress regulation and host engineering. Sauer et al. have analysed the differential transcriptome of a P. pastoris strain overexpressing human trypsinogen versus a non-expressing strain. 13 out of the 524 significantly regulated genes were selected, and their S. cerevisiae homologs were overexpressed in a P. pastoris strain producing a human antibody Fab fragment . Five previously characterized secretion helpers (PDI1, ERO1, SSO2, KAR2/BiP and HAC1), as well as 6 novel, hitherto unidentified, factors, more precisely Bfr2 and Bmh2 involved in protein transport, the chaperones Ssa4 and Sse1, the vacuolar ATPase subunit Cup5 and Kin2, a protein kinase connected to exocytosis, proved their benefits for practical application in lab scale production processes by increasing both specific production rates as well as volumetric productivity of an antibody fragment up to 2.5-fold in fed batch fermentations of P. pastoris . Since early recombinant DNA times, bacteria (especially E. coli) have been the most widely used microorganisms for recombinant protein production due to genetic simplicity, fast growth rate, high cell density production and availability of a spectrum of genetic systems, among others. For production processes being efficient, foreign genes are expressed from plasmids and under the control of inducible promoters, what results into non physiological and unusually high transcription rates. Strong production of recombinant proteins can lead to a stressful situation for the host cell, with the extent of the bacterial stress response being determined by the specific properties of the recombinant protein, and by the rates of transcription and translation . This fact has a clear and profoundly negative impact on productivity and probably protein quality. In addition, recombinant proteins fail, very often, to reach their native conformation when produced in bacteria . This is caused by a coincidence of diverse events impairing protein folding including bottlenecks in transcription and translation, undertitration of chaperones and proteases, improper codon usage and inability of disulfide-bond formation [106, 107]. 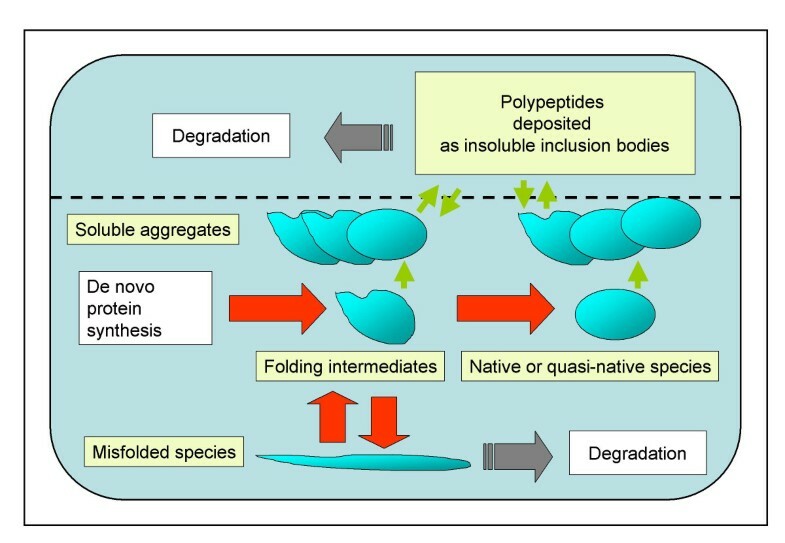 Misfolded protein species usually deposit as amorphous masses of insoluble material called inclusion bodies , recorded as by-products of bacterial protein production processes. Inclusion bodies are mainly formed by the deposition of unfolded or partially misfolded protein species that interact through hydrophobic patches unusually exposed to the solvent and with high amino acid sequence homology [109, 110]. The specificity in protein aggregation makes inclusion bodies highly pure in composition and therefore enriched in the recombinant protein itself. However, also truncated versions of the recombinant product, other plasmid-encoded proteins, but also defined host cell proteins can get entrapped within bacterial inclusion bodies [111–116]. Moreover, the presence of folding assistant proteins in inclusion bodies [117–119] confirm that specific interactions lead to entrappment of cellular proteins in these aggregates. The high purity of inclusion bodies makes them a convenient source of easily extractable protein that must be refolded in vitro by denaturing procedures, a fact that has been largely exploited for biotechnology purposes . The potential routes of a newly synthesized protein in the bacterial cytosol are illustrated in Figure 3. Schematic representation of protein folding and aggregation in recombinant E. coli. After de novo synthesis, a fraction of recombinant proteins (especially heterologous proteins with conformationally complex disulfide bridges) do not reach their native conformation and aggregate as insoluble deposits named inclusion bodies. Protein aggregates already exist in the soluble cell fraction, and can involve native or quasi-native protein species. The main cytoplasmic chaperones involved in the protein folding process (red arrows) include the trigger factor, DnaK, DnaJ, GrpE, GroEL and GroES. Both soluble aggregates and individual protein species can enter the virtual insoluble cell fraction (indicated by a dashed line) and deposit as inclusion bodies, in a fully reversible process (green arrows). Protein release from inclusion bodies is mainly controlled by DnaK, ClpB and IbpA,B. Proteases (lon, ClpP and others) attack both soluble and insoluble species with folding defects. In particular, proteases degrade inclusion body proteins in situ, or through a more complex process intimately related to the protein release process, and therefore, strongly dependent on DnaK. Although inclusion bodies are mainly found in the cytoplasm, they occur also in the bacterial periplasm if proteins have been engineered to present a leader peptide for secretion . In fact, a control quality system mostly separated from that acting in the cytoplasm assist folding of secreted proteins in the periplasmic space of gram negative bacteria. This is regulated through the combined activity of two partially overlapping systems, regulated by the alternate σ factor σE and by the Cpx envelope stress signalling system, that intricately combine the activity of chaperones and proteases [122, 123]. However, the simultaneous activation of stress signals in both bacterial compartments upon the production of misfolding prone proteins strongly suggest a close physiological and genetic connection between cytoplasmic and extracytoplasmic systems . The quality control and conformational stress in the periplasmic space has been extensively revised elsewhere [121, 125]. Different to the unfolded protein response (UPR) described in eukaryotic cells, the physiological reaction to conformational stress in the bacterial cytoplasm has not received any similar precise name. Transcriptome analysis of recombinant E. coli has resulted in a catalogue of genes up-regulated during protein production [126, 127]. Among them several heat shock genes have been identified (including those encoding the proteases Lon, ClpP, HslV and HslU, and the chaperones IbpA, IbpB, DnaK, DnaJ, ClpB, HtpG, MopA and MopB among others) but also other ones not directly involved in protein quality (such as YagU, YojH, YbeD and others) and whose precise role remains to be identified. This fact indicates that the conformational stress imposed by protein production is more complex and physiologically distinguishable from that caused by thermal denaturation, namely the heat shock response [128, 129], and includes several overlapping stress responses  Well characterized stress events have been observed during recombinant protein production such as SOS DNA repair  and stringent responses , although it is still be solved whether such reactions are directly associated to the prevalence of unfolded or misfolded protein species and the eventual connection with the σ32-regulated heat shock response. The expression of some of these stress genes is being used as a convenient marker of conformational stress in recombinant cells . The bacterial conformational stress itself has been poorly characterized from its physiological side. Instead, many efforts have been addressed to a rather practical issue such as minimizing aggregation, what in turn has resulted in a better comprehension of in vivo protein folding processes. Since solubility has been considered for a long time being synonymous with protein quality, increasing the relative yield of soluble protein has been targeted by physicochemical approaches. From already classical studies, it is well known that high temperatures impair protein folding and favour aggregation of the recombinant proteins as inclusion bodies [133, 134]. Therefore, reducing the growth temperature has been a general strategy used to minimize inclusion body formation [135–137] that, like other strategies, has rendered moderately positive, but unpredictable and product-dependent results . Fusion of folding-reluctant species to highly soluble homologous or thermostable proteins has in some cases, resulted in moderate enhancement of the passenger protein solubility [106, 138, 139]. Folding failures of recombinant proteins produced in E. coli is generally attributed to a limitation in the cell concentration of folding assistant elements, which cannot process the newly synthesized aggregation prone polypeptides. This assumption is physiologically supported by the overexpression of chaperone genes, in particular of chaperone genes from the heat-shock protein family, in response to recombinant protein overproduction [126, 127, 133]. Thus, coproduction of the main heat shock chaperones (specially GroEL and DnaK) together with the target protein has been largely explored as a way to minimize aggregation and to enhance the solubility of the recombinant protein product (reviewed in [140–143]). In many cases, solubility has been significantly enhanced by coexpression of individual chaperone genes, while in others an even negative effect on product stability and host viability has been observed. Selection of the suitable chaperone(s) is still a trial-and-error process. However, more recent results indicate that complete chaperones gene sets rather than individual chaperone genes with synergistic and/or cooperative activities (such as DnaK-DnaJ-GrpE and GroEL-GroES sets) will lead to a more predictable improvement of target protein solubility. [144–147]. Interestingly, when producing enzymes or fluorescent proteins in DnaK- cells, the biological activities and therefore the conformational quality of aggregated polypeptides is much more close to that of soluble versions, compared to wild type cells [148–150]. Furthermore, the overexpression of the dnaK gene along with a model GFP recombinant protein dramatically reduces the specific fluorescence of a GFP fusion in both soluble and insoluble versions . This indicates that DnaK directly or indirectly impairs the folding state of the aggregated proteins. In this regard, the production of GFP variants in absence of DnaK results in highly fluorescent inclusion bodies . In these cells, both the protein yield and quality were dramatically enhanced although the solubility is lower than in the wild type, as expected. This occurs by the inhibition of GFP proteolysis mediated by the proteases Lon and ClpP, which participate in the in vivo disintegration of inclusion bodies in absence of protein synthesis [153, 154]. Probably, such proteases act coordinately in a disaggregation complex [155–157] in which DnaK, ClpB and IbpAB remove aggregated polypeptides for proteolytic digestion. Therefore, although solubility can be indeed enhanced by high levels of DnaK, GroEL and other chaperones it occurs at expenses of quality and yield, probably by generally stimulating proteolysis . In fact, solubility and conformational quality are not only non coincident parameters  but highly divergent protein features . Usually, the cytoplasmic space of E. coli is a reducing environment. Therefore, disulfide-bonds within proteins are not formed, a fact that represents an additional obstacle for proper folding of many recombinant proteins. There are two approaches to produce disulfide-bonded proteins in E. coli expression, namely in vitro refolding of inclusion body proteins under appropriate redox conditions  or manipulating in vivo conditions by either converting the cytoplasm into an oxidizing environment or secreting the protein into the periplasmic space or even further into the culture medium (less reducing environments). Correct disulfide bond formation in the periplasm of E. coli is a catalyzed process, where the oxidation of cysteine pairs occurs through the transfer of disulfides from the highly oxidizing DsbA/DsbB proteins to the proof-reading proteins DsbC/DsbD which are able to rearrange non-native disulfides to their native configuration . In particular, overexpression of DsbC has been shown to increase the yield of correctly disulfide-bonded proteins in the periplasm of E. coli [160–162]. The co-expression of eukaryotic protein disulfide isomerases in E. coli can also favour the formation of disulfide bonds in the periplasmic space [163, 164]. Disulfide bond formation in the cytoplasm of E. coli can occur when the genes encoding thioredoxin reductase (trxB) and glutathione oxido-reductase (gor) are inactivated [165, 166]. A double-mutant strain containing appropriate mutations, known as Origami, has been used, for example, to generate active variants of tissue-type plasminogen activator  and functional antibody fragments in the E. coli cytoplasm [167, 168]. In some cases, recovery of functional cytoplasmic disulfide-bonded proteins can be further enhanced by coexpressing signal sequence deficient periplasmic chaperones and/or disulfide-bond isomerases such as DsbC [165, 167, 169, 170]. Unfortunately, trxB gor mutants exhibit impaired growth characteristics [112, 165], but, at least for antibody fragments it has been shown that expression yields of correctly disulfide-bonded proteins in the cytoplasm can be similar to those obtained by secretion into the periplasmic space . Although E. coli is still the most commonly used prokaryotic organism for heterologous protein production, other bacterial hosts are becoming more and more attractive. Gram-positive Bacilli strains are also frequently employed at industrial level. In contrast to E. coli, their outer envelope has no lipopolysaccharides, also called "endotoxins" since they exert a pyrogenic activity in humans or other mammals. Therefore, many pharmaceutically relevant products have been obtained in several strains . In addition, the Bacilli strains are attractive hosts because they have a naturally high secretion capacity, as they export proteins directly into the extracellular medium. Amongst Bacilli species, the protein secretion pathway in B. subtilis have been deeply investigated at molecular level and a comprehensive literature survey is reported in . Several bottlenecks in the expression and secretion of heterologous proteins have been highlighted . The secretory pathway of proteins can be divided into three functional stages: the early stage, involving the synthesis of secretory pre-proteins, their interaction with chaperones and binding to the secretory translocase complex; the second stage, consisting in translocation across the cytoplasmic membrane; and the last stage, including removal of the N-terminal signal peptide, protein refolding and passage through the cell wall. A pivotal role in the whole secretion process is played by molecular chaperones . B. subtilis has two types of molecular chaperones, intracellular and extra-cytoplasmic molecular chaperones. GroES, GroEL, DnaK, DnaJ and GrpE are intracellular molecular chaperones. Besides being involved in and largely responsible for protein folding and minimizing aggregation, these chaperones maintain pre-proteins (the products to be secreted) in translocation-competent conformations . PrsA is the only known extracytoplasmic folding factor in B. subtilis. PrsA is a lipoprotein that consists of a 33 kDa lysine-rich protein part and the N-terminal cysteine with a thiol-linked diacylglycerol anchoring the protein to the outer leaflet of the cytoplasmic membrane . Subsequent folding of a secreted mature protein into a stable and active conformation usually requires PrsA protein. In prsA mutants, the secretion and stability of some model proteins is decreased, if not abolished, while overproduction of PrsA enhances the secretion of exoproteins engineered to be expressed at a high level . There is, however, a physiologic limit to the overloading of B. subtilis secretory pathway. The massive production of homologous and heterologous exoproteins has been reported to induce a phenomenon called "protein secretion stress response" . The CssRS two-component regulatory system is able to detect the presence of partially folded or unfolded exo-protein intermediates and activates the transcription of several genes, among which a key role is played by htrAB. These genes encode two membrane localised serine proteases involved in the proteolysis of aberrant products . Several gene expression systems using non-conventional prokaryotic organisms as host cells have been developed over the last decades. Each bacterial host was generally implemented to overcome defined problems/bottlenecks observed during the recombinant production of specific protein classes in conventional systems, such as E. coli and B. subtilis. The use of such non-conventional systems is still very limited and largely suffers from the lack of molecular details concerning host physiology and any other phenomenon related to massive recombinant protein production. Notwithstanding, some of them may represent useful model systems to further investigate on the optimization of recombinant protein folding and quality. In this context, some interest has been raised by the implementation of an Antarctic Gram negative bacterium as production host. Pseudoalteromonas haloplanktis TAC125 was isolated from a sea water sample collected in the vicinity of the Dumont d'Urville Antarctic station, in Terre Adélie. It is characterised by fast growth rates, combined with the ability to reach very high cell densities even in uncontrolled laboratory growth conditions and to be easily transformed by intergeneric conjugation . There features made P. haloplanktis TAC125 an attracting host for the development of an efficient gene-expression system for the recombinant protein production at low temperatures of thermal-labile and aggregation-prone proteins . Furthermore, it was the first Antarctic Gram-negative bacterium which genome was fully determined and carefully annotated . Since high temperatures have a general negative impact on protein folding due to the strong temperature dependence of hydrophobic interactions that mainly drive the aggregation reaction , and favour conformational stress, the production of recombinant proteins at low temperatures represents an exciting model to study the dynamics of protein folding and misfolding and to improve the quality of the products. The growth of E. coli below 37°C has been often explored to minimize aggregation but without consistent, protein-irrespective results. Also, the use of suboptimal growth temperatures might negatively affect the biology of the host cell and the performance of the process in undesirable and non predictable ways. Recombinant protein production in psychrophilic bacteria, i.e. at temperature as low as 4°C, may minimize undesired hydrophobic interactions during protein folding, desirably resulting in enhancing the yield of soluble and correctly folded products while operating close to the optimal growth range. Furthermore, with respect to mesophilic cells growing at suboptimal temperatures, psychrophiles contain a full set of folding factors already adapted to assist optimally, when required, protein folding at freezing temperatures. The efficiency of the cold-adapted expression system was tested by producing several aggregation-prone products in P. haloplanktis TAC125, such as a yeast α-glucosidase , the mature human nerve growth factor , and a cold adapted lipase . All the recombinant products resulted to be fully soluble and biologically competent. In vivo protein folding is a very complex issue that involves many cellular proteins and physiological responses. During recombinant protein production, conformational stress conditions elicited by the synthesis of aggregation prone polypeptides profoundly alter the physiology of the host cell, triggering mechanisms addressed to manage potentially toxic misfolding protein species and to recover the cell folding homeostasis. The use of different microorganims as factories for recombinant protein production, including yeast, filamentous fungi and bacteria has resulted in dramatic gains of information about the biology of such stress responses, and has provided valuable information to better understand the mechanics of in vivo protein folding and aggregation. However, so far it has not been possible to create the "perfect folding environment". Especially with respect to industrial protein production processes, the direct impact of altered process conditions on recombinant protein folding remains unclear. Ongoing research in the authors' labs is targeted to elucidate the physiological responses of different eukaryotic and prokaryotic microbial hosts on a genome wide level in order to interrelate environmental stresses to protein folding/aggregation mechanisms and eliminate bottlenecks. to PF: Complementary Actions Plan from the Spanish MEC, Project No. BIO2005-23733-E. AGAUR (Generalitat de Catalunya, Spain), Grant 2005SGR 00698 and Reference Network in Biotechnology (XerBa). to DM: Austrian Science Fund, project I37. All authors contributed equally to this manuscript, and read and approved the final version.